Masterprofile logic: Create a Masterprofile once and based on that variations in other profiles are much easier to define. 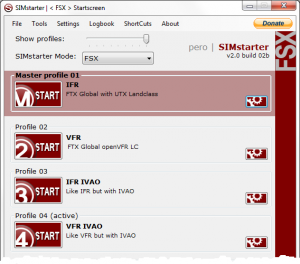 I decided to present SIMstarter as a Freeware with the option to do a donation. Since I invested a lot of time it would be great if you donate for my project (at the menubar in SIMstarter). Thanks to all my beta testers who helped making SIMstarter such a great tool. Special thanks to Günter Steiner and Jürgen Beisler.